Allied is a World War II movie where all the action happens far from the front lines. Whether in the cafes and reception halls of Casablanca or the bombed-out streets of London, the characters face the tribulations that characterize life away from the military clashes. More a spy thriller than a traditional “war film”, Allied seeks to unfold like a Len Deighton novel - plenty of genuine period details entwined with a fictional story of undercover intrigue, espionage, and betrayal. On the whole, it works although perhaps not as well as it might have if the central relationship had more carefully established. There are also problems with a sense of inevitability during the second half. Despite a few halfhearted red herrings used to instill uncertainty, the resolution is too easy to sniff out. With a nod to the 1942 Humphrey Bogart classic, one of Allied’s early scenes transpires in Casablanca, in an establishment not all that different from Rick’s Café. It wouldn’t have been a shock to see Bogart or Claude Rains hanging out or to hear the strains of “As Time Goes By” playing over the din. In this place, Canadian intelligence officer Max Vatan (Brad Pitt) meets French resistance fighter Marianne Beausejour (Marion Cotillard). Under the pretense of being a married couple enjoying the freedom offered in the Moroccan city, the two plot the assassination of a German ambassador. With the odds against them (Max estimates “60-40 against”), the closeness and tension of the situation sparks a romance. But can a love affair conceived during an assignment survive a transition to the home front? And, with the war still raging, can the seeming security of a desk job protect Max from a tragedy that traces its roots back to Casablanca? Over the course of a rich and varied career, director Robert Zemeckis has experimented with techniques and innovations. Titles like Back to the Future, Who Framed Roger Rabbit?, Forrest Gump, Contact, and Cast Away have confirmed his superior talent as a storyteller and put him on the A-list. Allied represents one of his more conventional films, offering little that’s unique or trailblazing and using special effects to enhance the period detail rather than to push the envelope . When Zemeckis’ entire career is considered in retrospect, Allied is unlikely to be remembered among his great productions. Although the movie runs at a little over two hours, it could have benefitted from more screen time. The 40-minute Casablanca segment, in which Max and Marianne’s romance begins, feels at time rushed and truncated. Sometimes, it only takes a half-hour for a movie to convince its audience that two characters are in love. Unfortunately in this case, we glimpse the attraction but its culmination feels forced. More time to get to know them and witness their deeper interaction might have made a difference. Some scenes - like one in which Max covertly watches Marianne undress - are honest and believable; Allied could have benefitted from more of these. It’s not a matter of chemistry - Brad Pitt and Marianne Cotillard aren’t destined to become one of movie-dom’s great screen couples but they generate sufficient heat - but of a narrative that doesn’t want to slow down to let the characters breathe. Allied’s second half focuses on a spy novel mainstay mystery: someone in London is sending messages to the Germans and it becomes Max’s duty to identify (and, if necessary, execute) the guilty party. The movie sets up various checks and balances about whether the methods being used to trap the traitor are reliable or part of an elaborate “game” and whether there are justifiable causes for the betrayal. Max, unable to watch passively as events unfold, instigates his own investigation - an action that sees him fly to France and become involved in a pitched street battle with Germans. In the end, however, the espionage elements are straightforward and the conclusion is disappointingly uncomplicated. If the filmmakers were stretching to achieve something worthy of Le Carre or Deighton, the result falls short. There’s an emotional resonance to the denouement but it could have been more potent. Aside from small roles for Jared Harris (as Max’s commander) and Lizzy Caplan (as Max’s lesbian sister), this is a two-character play. Fortunately, both Pitt and Cotillard are seasoned thespians capable of doing wonders with uneven dialogue and an undercooked plot. Cotillard shines brighter than Pitt in this case, in part because Marianne is more dynamic than Max. Pitt plays the heroic pilot with a stiff upper lip. It’s interesting that the actor has gravitated toward World War II films (this is his third feature, following Inglourious Basterds and Fury). He’s perfectly at home in ‘40s garb and his charisma transfers intact. Cotillard’s appeal is timeless. 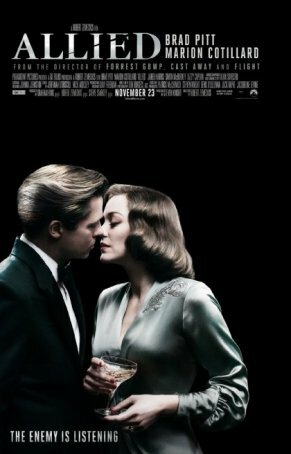 Allied probably isn’t prestigious enough to attract much Oscar buzz but it’s too good to be tossed into theaters without a publicity push. Films like this - offering two hours of solid entertainment with attractive leads, exotic locations, and large dollops of romance and suspense - would have done excellent business a decade or two ago but the movie business has changed since then. Allied isn’t a great film but it’s made with sufficient care and skill that it deserves to be seen. Unfortunately, a poor showing at the box office may further diminish the likelihood of Hollywood releasing more films like this one.